Penney Azizi is a member of Nixon Peabody’s Complex Commercial Disputes practice group. 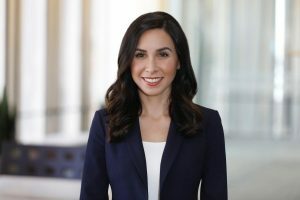 She represents corporations and individuals in litigation involving a diverse variety of matters, including construction, contract, and products liability disputes. In addition to her commercial litigation focus, Penney is committed to pro bono work. She represented an individual seeking asylum before the Ninth Circuit Court of Appeals and a foster mother seeking adoption of her foster children before the juvenile dependency court. Penney earned her J.D. from UC Hastings College of the Law, where she led the the Alternative Dispute Resolution Team. She earned her bachelor’s degree in Psychology at Loyola Marymount University.